I've been putting a lot of time into understanding all of the different valve designs out there. I am getting convinced that the Ohlins fork valve kits are really the way to go. They repair most of the problems with the Honda HMAS valves and do not flow too much oil like the Racetech valves. Dan Kyle is the "go to guy" in the US for these. That said, they will still require modification to reduce turbulence; ie. 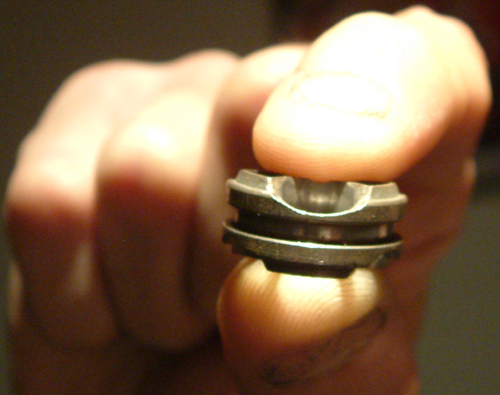 heavy chamfering of the back side of the refill and valve ports, they will need some lapping to make a perfect shim seal prior to installation, and the actual valve port size may need some fine tuning depending on how you use your fork and how it is set up. For reasons stated earlier regarding the factories desire to make a bike that will work reasonably well for a fixed price point, most stock cartridge damping systems are designed for saftey and economy rather than performance. The cheapest hole to make is, of course, round. Also, to prevent excessive travel in high speed by heavy riders or really hard hits the ports are small. By opening these ports up, the fork will be able to move at much higher speeds and the shim stack exclusively will adjust the high speed damping curve. 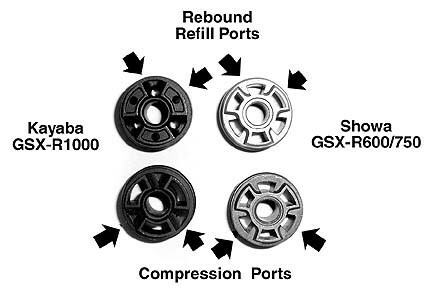 A high flow compression valve is a very good tune to make for riders that push their bike very hard and are looking for superior suspension performance. The sequence of the shim stack serves two functions. one is to determine when the H.S. 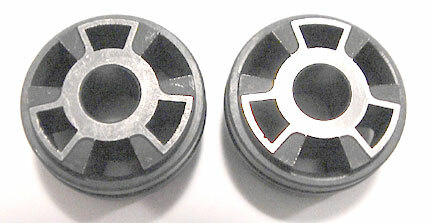 valve starts functioning; two is to determine the shape that the damping curve that the H.S. circuit will form in the transition region of the damping curve. 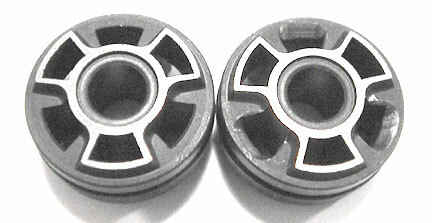 Shim stacks can be constructed in single, two, or three stage configuration. Sportbikes tend to have a single stage stacks. motocross bikes tend to have two stage stacks. It isn't that a single stage stack is really better or worse than the multi stage stacks, it's just that it makes tuning far simpler with very good results. Learn more about how to stack shims HERE. N1 = Number of shims to replace. M1= Factor of the shim to replace. 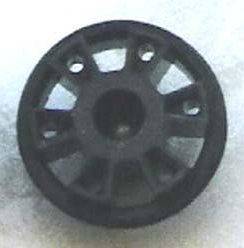 N2= Number of replacement shims. We would like to replace them with 0.15mm’s. This conversion is obtained by doing a simplistic moment of inertia calculation on different shim thicknesses. This does not compensate for the non-uniform sectional area on the shims, but it is valid enough for comparison. 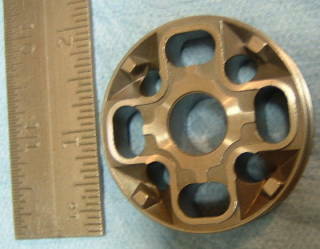 These pictures are of the ultra high end K-tech 25mm Cartridge Fork Internals. 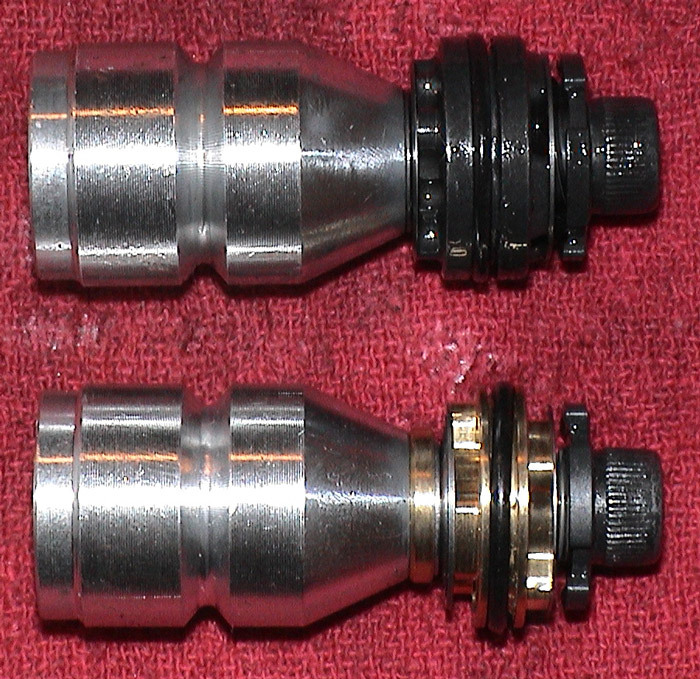 The picture below shows a stock Showa cartridge fork compression valve (right) and a Race Tech Gold Valve replacement (left). you can see how much more oil the Gold Valve will pass compared to the stock part. Below is a picture from Dan Kyle's website. Here is a picture of Öhlins, Honda 4 port (HMAS), Racetech goldvalves and Showa 3 port (from a Suzuki - very similar to Honda 3 port). Top two rows are rebound and bottom two rows are compression. First row shows the shim face for all rebound valves and for compression valves row three shows shim face for Öhlins and RT and fourth row shows shim face for Showa. 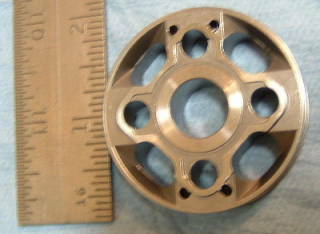 A Showa/Honda RS250 GP 25mm valve. Below is a worksheet I made in an attempt to understand how the number of ports change the flow of the oil and bending shape of the shims. Clearly, the 3 port design is the most flexible and efficient design. I cannot for the life of me understand 4 or 5 port valves. 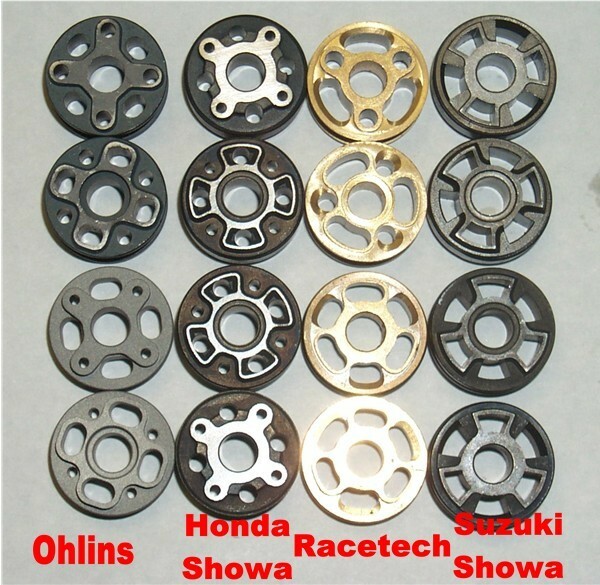 Why do Showa and Ohlins do it? Understanding and tuning Honda HMAS valves. My current take on them is that they initially offer some transitional high speed damping like a high flow valve, but they then begin to behave more like an orifice as the speed reaches peak, in general, progressive high speed damping. The Ohlins valves are very similar to the Honda valves. What do you do with the ohlins valves? Can you really notice the difference going from Honda to Ohlins? I also figure that the shim stack may become far more of a factor with these valves when using an ISO 15 fluid rather than the stock ISO 37 fluid. Reducing the oil height to a more realistic height than stock, so that the shock isn't ramping up like crazy regardless of high speed damping, is certainly a necessity. I'm going to attempt to work with them on my next bike, since I never really worked with them on my current bike before switching to the race tech high flow valves. I'd just hate to feel that i didn't give a good part it's due before changing it.